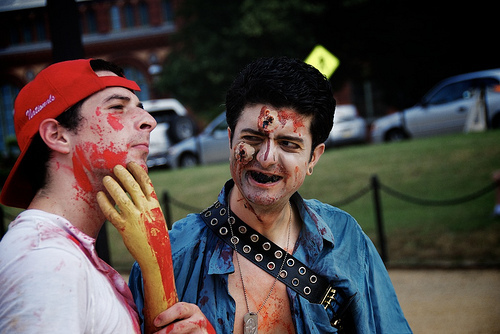 PoPville » Dear PoPville – Where Can I Watch The Walking Dead? Do you know of any bars or restaurants with a television that would want to show The Walking Dead premier on Sunday night? I think that’s usually kind of a slow night for most businesses, and I know I for one am tired of watching it and others like Game of Thrones alone at the house when I know there are other people who love it also. For example, when I was reading the Game of Thrones series on the metro, I had great conversations about the books with at least four strangers over the course of only two weeks! And The Walking Dead has a pretty good following as well, how cool that would be to meet other people into it at a neighborhood bar or something. Great idea. Any other fans of Walking Dead? What bars do you think might be willing to show it? Blue Banana? Red Palace? Others?